Paradoxically, a relentless emphasis on surface often evokes a sense of infinite space and continuity. Such expansiveness is especially evident in the work of Richard Howe. Howe’s teeming compositions call to mind the ambiguous relationship between order and chaos that was central to John Cage’s scores.
. . . density at its most extreme . . . extraordinary . . . .
At the University of Illinois in the 1960s I studied composition with Herbert Brün and Wolf Rosenberg, two very different but at the same time very German composers, who, each in his own way, exemplified the post-WWII serial avant-garde’s obsession with structure. At the same time, I was putting myself through school working for two very different composers: first LeJaren Hiller, the computer music pioneer, and later John Cage, who was for several years an Artist in Residence at the University of Illinois Institute for Advanced Study. For Hiller I translated coded computer print-outs into music notation for publication and performance. For Cage, I restored—in a practical, not a conservator’s sense of the word!—a number of manuscripts (among them his Piano Concerto) that had deteriotated badly due to their being reproduced by his publisher, Peters, using a blueprint-like process akin to the one architects used to use for their plans and drawings. Later, as a result of my work with Hiller’s print-outs, I got the job of translating into music notation the sixth and seventh harpsichord parts of Cage’s HPSCHD, a randomly generated musical mosaic of two-bar excerpts from 18th and 19th century keyboard favorites like Mozart, Beethoven, and Chopin, among others. Ever since then I’ve been fascinated by the interaction of chance and structure and by the interaction of quotation as an abstract element and as meaningful, i.e., recognizable element in its own right. For me these interactions come most alive when—or where—they become so intense that what is structure and what is chance, what is quotation and what is not, become irretrievably ambiguous. My fascination with such ideas, even as a student, 40 years ago, was more with the visual representations of these kinds of music than with the music itself. When I came back to the arts after a long detour through the computer industry, I let go of the music altogether in favor of the visual represenations themselves. But visual representations of what? —— In fanciful moments, I sometimes imagine them as visual representations of a missing music, a music I no longer hear but still can—almost—see. A note on the images in the galleries: the cobbler’s kids really do go barefoot: many of the images in these galleries not only pre-date my serious engagement with photography but represent works that are no longer available to me to photograph again, and properly. I’m afraid—and perhaps also hopeful—that the viewer will have little trouble distinguishing the older images from the newer ones. One additional remark: the drawings made with woodless (graphite) pencils are covered with thousands, in some cases tens of thousands of individual dots, ranging in weight from very bold and black to very thin and faint. 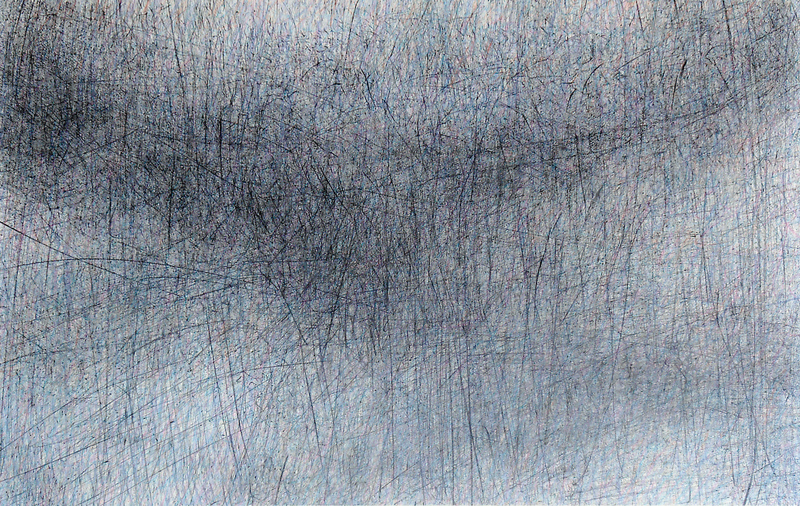 The images of these drawings are also highly speckled, which is not the result of “clotting” in the image processing but a fair representation of the drawings themselves. Many of the works shown are in private hands. I keep some of them in my studio; the rest may be viewed at the Kentler International Drawing Space, Florence Neal, Executive Director. The Kentler is located at 353 Van Brunt Street, Red Hook (Brooklyn), NY 11231. The Kentler website is www.kentlergallery.org; telephone 718-875-2098.